A new language of Business. 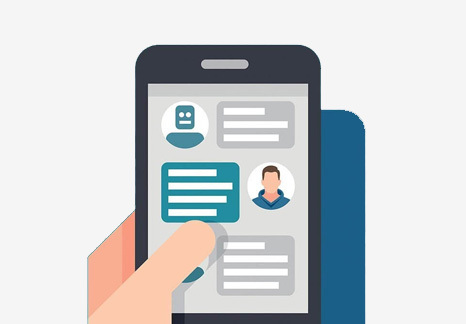 A chatbot is a service, powered by set rules and sometimes artificial intelligence, which users can interact with on a standard chat interface. Chatbots rely on machine learning and deep learning to participate in a two-way conversation with end-users that enhances customer engagement. They replace the need to have a human marketer conversing with a consumer and can be easily programmed to handle standardised, repetitive tasks. The use of natural language processing ensures the conversation feels natural and intuitive to the end user. Netcore creates intelligent virtual agents which fundamentally change the way buyers and sellers experience our brand. We offer professional cloud hosting, maintenance and support for our client's chatbots. We follow the industry best practices and we work with some of the biggest cloud providers. Discover AI that gets personal because it understands your customer's personality, tone and emotion, then interacts in ways that are engaging, helpful and quite human. Everything works like a charm with your existing search with Smartech, CRM, knowledge bases and for relevant recommendations and solutions for the customers query. We'll deploy your future-proof solution faster and better than our competitors, with less workflow impact and more training and support. Seeing is believing. Netcore Chatbot NLP quickly and easily gets what your customers mean — making repeated questions a thing of the past. Many more shoppers who enter a query, even if it's slang, misspelled, etc., will leave happy, which means higher conversion and add-to-cart ratios. Between Chatbot NLP, Meaning-Text Theory and Gap Analysis is a conversational AI solution that handles your customers' searches, transactions, password resets and beyond - non-stop 24/7.